Skoda’s Superb has been given a makeover, adding a glamorous new look to the company’s flagship vehicle. There’s a totally new front, re-designed rear and a host of interior improvements to give it more of an executive style cabin. But while the new image gives the car even more appeal it’s still the unrivalled interior space that will continue to be it’s best attribute. Anyone trying the rear seats in a Superb finds it difficult to believe just how much room there is, both in the saloon and estate. Trying out the new re-vamped estate model even I found myself still surprised by just how much legroom there was and I was expecting it. From the outside the Superb looks a big car but nothing prepares you for the clever design work which has produced such limousine-like interior proportions. You can stretch your legs out fully without touching the backs of the front seats. And when it comes to boot space the Superb Estate is a winner too, offering 633 litres of luggage space with the rear seat backs in position and a staggering 1,865 litres with them folded flat. A roller blind-style cover protects your luggage from prying eyes. If you are looking for an estate car that offers refinement with the luggage capacity of a mid-size van in a very up-market package the Superb ticks all the boxes. And while the starting prices of the new models have increased by some £500, Skoda says you now get £1,500 of additional kit. In terms of appearance the front of both the estate and hatch have been completely redesigned from the A-pillars forward with new bonnet, wings, bumper and grille. Bi-xenion headlights are now standard – and really improve night vision – as are daylight running lights on the Elegance spec model that I had. At the rear brighter LED strips now fitted as standard ensure that you are more visible to vehicles behind you. But while there are a host of changes there are still a myriad of features which have been retained, including fitting an umbrella in the rear passenger door so you are never caught out by the weather. The estate I tried was the Greeline, the model aimed at fuel conscious motorists and promising average fuel consumption of more than 67 miles per gallon, an improvement of 3mpg on the previous Greenline Superb. Under the bonnet is a 1.6-litre, 105bhp TDI engine which, despite the size of the Superb and my initial misgivings, proved to be surprisingly responsive and enjoyable to drive. Greenline versions have a lower chassis, are lighter in weight, come with low rolling resistance tyres, a stop/start system and energy recovery to recharge the battery. All features which help to ensure that visits to your local fuel station are few and far between. The Elegance is the second highest spec model in the Superb line-up and comes with full leather upholstery, electrically adjustable and heated front seats with three memory settings on the driver’s seat. 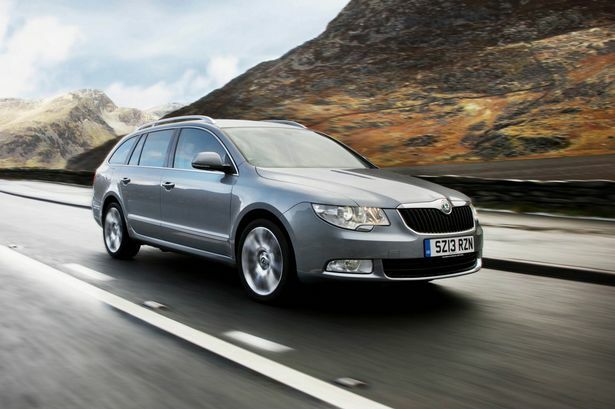 In fact in Elegance trim this estate is now a car which really justifies its boastful name – Superb. Mechanical: 1,598cc, 4 cyl, 105bhp diesel engine driving front wheels via manual gearbox.